The new Cadillac ATS-V performance car is almost ready. The ATS is Cadillac’s smallest vehicle, designed to compete – and win – against the BMW 3 Series which defines the smallish sports sedan marketplace. However, one reason, other than outright sales volume, that BMW can lay claim to the segment it created is performance. Many have tried, but none have built a performance reputation that can match the BMW M3. That may be about to change. Our editor, Patrick Rall, spotted a test mule of the super-ATS while driving in Michigan the evening of April 9th. Just like the line Cheech Marin made famous, this Cadillac was “Lowered to the ground. Twice pipes…” In fact, the twice pipes (dual exhaust outlets) had quad diffusers and were moved closer to the centerline of the car. That is the kind of detail only an autowrtiter can see as a car passes by quickly. By the way, quad exhaust tips can be found on – you guessed it, the BMW M3. Rall took chase after the car, but in the interests of public safety and preservation of his privilege to drive in the state of Michigan, gave up after being separated by a red light. One sighting does not mean a car is a done deal. However, in today’s May 13th issue of Autoweek on page 11 there is a picture of an ATS test carwith many of the features Rall saw – and it is a coupe! To those in the auto industry two mules caught driving on public roads on separate occasions means that the new ATS-V is in final road testing. GM has its own immense proving grounds protected from professional spy photographers. To risk an amateur spy shot means that the car is basically done and being road tested for final inspections. In order to compete with the BMW M3, Cadillac will need a few bits of go-fast hardware. First it will need an engine capable of over 400 horsepower. The BMW M3 sports an eight cylinder with 420 horsepower. Cadillac has such an engine, and it is a bit more modern in one key way. More and more, all of the premium automakers are dropping cylinders and adding boost. The normally aspirated V8 in the BMW M3 is so 2005. It would not surprise us if it moved to a new engine. Except BMW already uses a twin turbocharged six in its “normal” 3 Series sedan and 4 series coupe. Cadillac’s new 420 HP (funny how they happened to have exactly that same estimated horsepower) is already announced for use in the premium Cadillac CTS. It will surely be the new Cadillac ATS mill. Another thing the ATS-V will need is a door-ectomy. 4-doors are OK, but everybody knows that the coolest car in a line is the coupe. That is true of the CTS-V and true of the BMW M3. Autoweek’s spy photo of a two-door ATS shows us Cadillac is more than serious about making the ATS-V. Dropping the back two doors will also help Cadillac in one odd way. Presently, one of the few bad things anybody can find to say about the ATS is that rear legroom is cramped. Lexus has its own 3 Series competitor called the IS350, and it just added 3 inches more legroom in back to solve that deficiency. Doing that now for Cadillac is not an option. However, it can lose the two rear doors and make it clear to everyone this is a driver’s car. Those two benches in back are for overnight bags and occasional transportation of children. There are still some details to emerge. Will Cadillac go ahead with just its torque converter automatic transmission? If so, it will not stack up well against the Lexus IS350’s eight speed, or BMW’s M-DCT Drivelogic double clutch manumatic. We can hope for a new transmission from Cadillac, but it could always insert a manual. That would again be old school in a way buyers of $70,000 two-doors are not impressed by. We do expect see magnetic ride control suspension, a limited slip differential, and massive Brembo brakes. In this configuration of GM componentry the ATS-V will have the ingredients to allow for success. Given GM’s recent results with the Cadillac CTS-V, Camaro ZL 1, Camaro Z28 and other amazing performance variants of existing cars, we know the results can work. 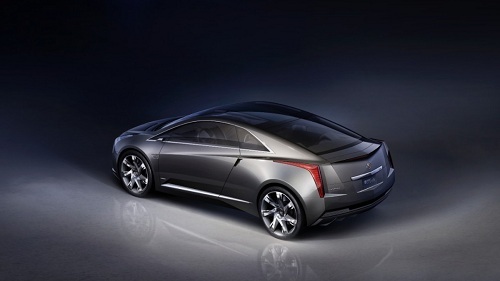 Obviously Cadillac isn’t straying too far from the formula with its ATS-V. In this case that is a good thing. Autoweek is in agreement with our editor Patrick Rall, and this writer, that the vehicle we all suspected was coming is now being readied for launch. Possibly in the fall of this year. Photo is of a Cadillac Converj Concept. For reference only. Courtesy of GM media site.